Roll Up USB Drum Kit – For Those About To Unroll, We Salute You! | OhGizmo! Roll Up USB Drum Kit – For Those About To Unroll, We Salute You! By Andrew Liszewski on 04/03/07 • Leave a comment! You can add another item to the ‘current fad’ list today, roll-up-(insert product name here.) 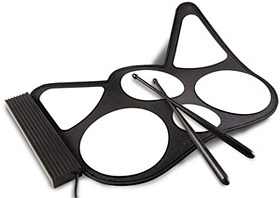 So far I’ve only seen computer keyboards and pianos but now you’ll be able to easily carry your synthesized drum kit too thanks to this roll up USB drum set. It uses six pads that can each be configured with different sounds or samples from an included library. Hopefully you can add your own as well. The included software also has a learning feature if you’re just starting out that allows you to play along with a song at your own preferred tempo. Once you’re more confident with your skills you can even record your beats and put together a killer demo tape. The Drum Kits should be available by the end of April (from Dream Cheeky) for about $30 with a limited initial run of 1000 units. More will be available come August but at an increased price of $45.